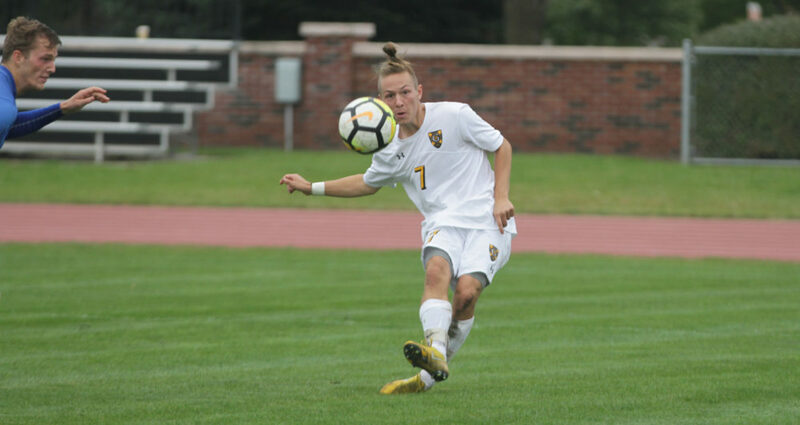 SAINT PETER, Minn. – The Gustavus men’s soccer team defeated St. Scholastica 4-2 Tuesday in non-conference action, winning its third straight match to improve to 8-1-1 overall. After a scoreless first half and a 30-minute lightning delay, the second half turned into a shootout with six goals. Trace Dobson (So., Sioux Falls, S.D.) scored the first goal off a corner kick by Matt Gibbons (So., Minneapolis, Minn.) in the 50th minute. The Saints answered in the 58th minute, but the Gusties were able to respond three minutes later on a goal from Arthur Parens (Sr., Wayzata, Minn.), who benefitted from a scrum in front of the net. Gustavus then took a 3-1 lead in the 66th minute as Scott Heinen (So., Aurora, Ill.) scored his first goal of the season. The Saints would not go quietly, though, and brought the score back to one with a goal in the 68th minute. But Gibbons tallied the contest’s last score with a goal off a free kick just outside the penalty arc. The Gusties outshot the Saints 16-13. There were also six yellow cards. Anders Severson (Sr., Woodbury, Minn.) made six saves. Gustavus returns to MIAC action at 3:30 p.m. Saturday at Bethel.